Beginning her art career at quite a young age, Lysa Ashley would trade her small drawings for sweets with her fellow classmates! Lysa is an artist and teacher from Corona, California. 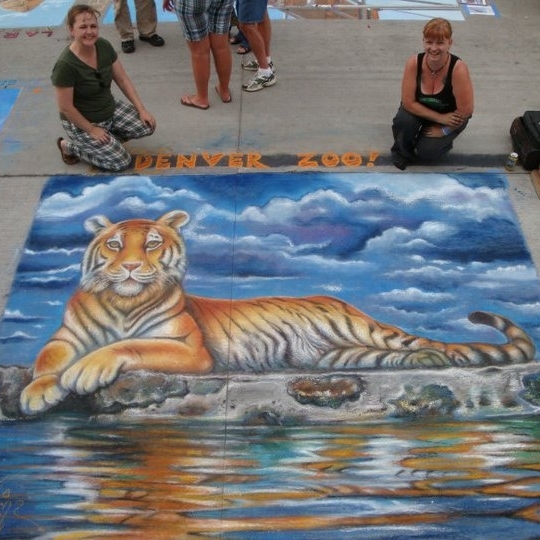 She has been street painting for 22 years, and loves the performance aspect of the art form, and interacting with spectators. People and animals are her favorite subjects; she is inspired by the emotions and personalities seen on faces. As a teacher she enjoys the challenge of integrating visual art into the academic curriculum to motivate children in both learning AND creativity! She teaches street painting workshops to children and adults alike. Lysa is regularly sought out to do paint for commercial venues and corporate clients. She has traveled extensively winning various awards for her images such as "Best of Show", "People's Choice", and "Artist's Choice".